Arched Panel With Delicate Scroll Casting In Center With Fleur-De-Lis, Casted Ends, And U Scrolls, Each End With Small Casting. Features A Brushed Gold And Black Over Silver Finish. Recommended For Use With P08 Link Spring (Sold Separately). 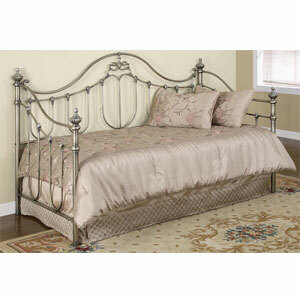 Accommodates A Twin Size Trundle Bed (Sold Separately). Some Assembly Required.